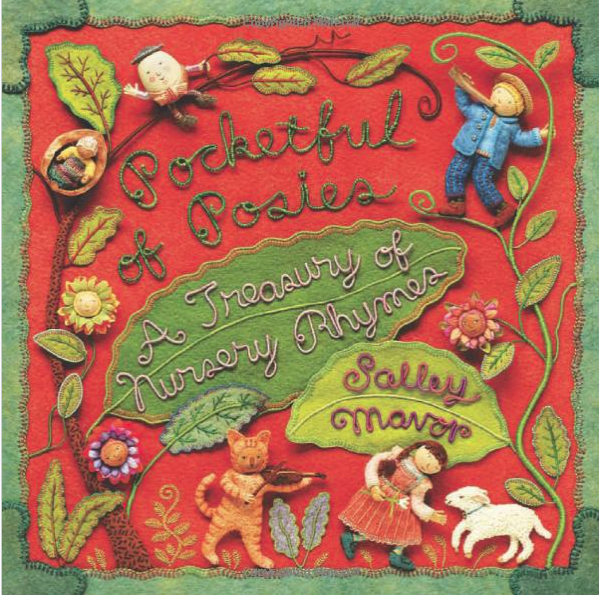 April is National Poetry Month and what better time to introduce children to the delightful sounds of language with a collection of nursery rhymes. I’ll make some book recommendations at the end of this post, but first—why should we start with nursery rhymes? We crawl before we walk, babble before we speak meaningfully, and speak before we read. Mother Goose’s rhythmic, repetitive rhymes delight the youngest children, who are interested in the sounds of language. Only gradually does the appeal of rhyme and rhythm give way to other characteristics of language such as imagery, imagination, or narrative content. Repetition engages little listeners more than novelty, as any parent who has read the same beloved storybook for the tenth time will testify. Like the joy of peek-a-boo, the pleasure in hearing a favorite verse, song, or simple story seems never-ending. Preschoolers and kindergartners experience the repetitive rhythm and rhyming elements of language most strongly, and like a ride on a carousel, the pleasure is circular and continuous in its ability to please. The most important language experience for very young children is living speech. Reading aloud to children of this age is essentially an experience of speech rather than reading. A bedtime or naptime “story” of five or ten minutes of Mother Goose rhymes or traditional children’s songs and lullabies can introduce the daily custom of listening to a story, which will gradually become the independent reader’s daily reading habit. Adult readers in the home who model this habit give it importance and status for imitation. Here are some of my favorite collections of nursery rhymes—some new, some old. Beautifully handcrafted, full-colored illustrations in fabric relief bring Javor’s collection to the level of enchantment that will delight children and adults alike. Mavor also incorporates natural materials such as acorn caps and driftwood along with plant-dyed wool in her fabric pictures,. Not to miss! Mavor won both a Boston Globe Horn Book and a Golden Kite Award for her illustrations. This book is a perfect size for young children to hold alone with its tall narrow size. In addition, there are only one or maybe two poems per page making it easier reading and adding visual appeal. Make Way for Reading has more than 45 books listed under Poetry. To learn more or to order this book, click here. Other nursery rhyme collections include those by Tommie dePaola, Tasha Tudor, Blanche Fisher Wright and anthologies such as My Book House. This entry was posted in News and Announcements, Pam's Perspectives and tagged Children's Books, Illustrators, Poetry, Reading List. Bookmark the permalink. Both comments and trackbacks are currently closed.